Goodbyes Are So Hard. 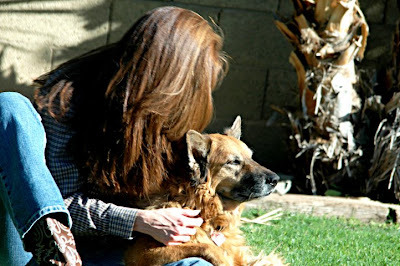 . .
Today I said goodbye to one of my dearest friends. We have spent the past 16 years together and she will be dearly missed. 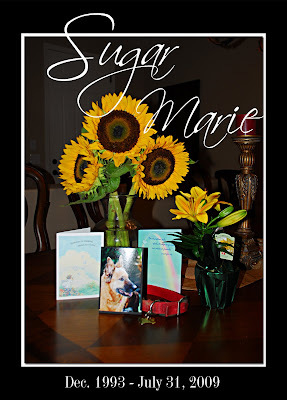 So tonight, my blog is dedicated to her, my dear, loyal, faithful, and beautiful friend, Sugar Marie. I want to start off by saying thank you to my dear friends that sent flowers and cards today - it meant the world to me. In fact as the first flowers arrived I had just been thinking about going to the store and buying myself some bright yellow sunflowers to brighten my home, as it seems so dark without Sugar. It was a huge surprise when Gary walked in with 3 gorgeous sunflower stems from our friends and neighbors Dennis & Susan - Thank you friends! Not 15 minutes later as I was putting the sunflowers in a vase, there was a knock at my door and my dear friend Sherri was standing there with some beautiful yellow day lilies that she and her daughter picked out for me. Thanks Garvers - you guys are the best. 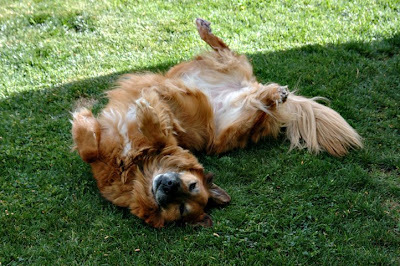 So, this is my dear Sugar, several years ago when she was still young and vibrant and full of life. 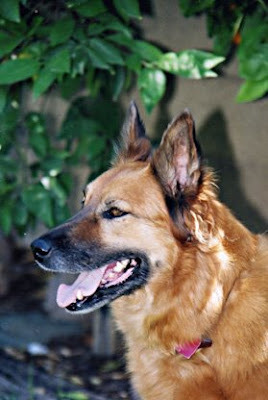 She was a beautiful dog and this is how I will always remember her - not frail and weak like she sadly had become. This is my dear little girl when she was still just a baby. 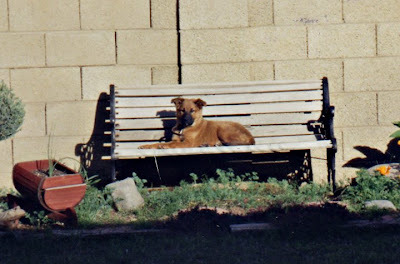 How she loved this bench and how many hours she spent there sunning herself. 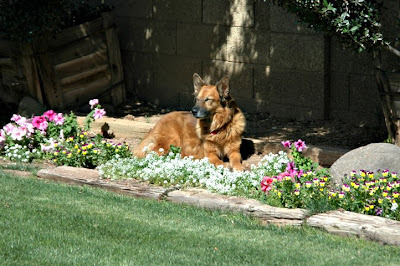 In fact, even after the beanch was long gone this was Sugar's spot in the yard and she loved to take an afternoon nap there in the sunshine. 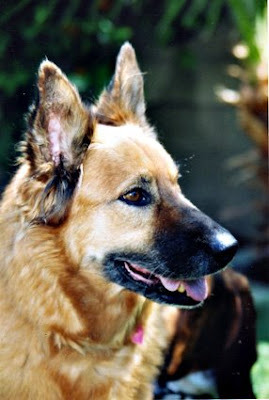 I spent this afternoon going through 16 years of photos of my beloved friend. It is funny all of the memories this conjoured up for me. Strangely, looking through all of the photos made me happy and kept me from spending the afternoon crying. Photographs have a way of helping - bringing those we love back to us when they are gone. I am thankful for all of the photos I have of her. I just wish there would be time for more. Sugar Marie was a character! She loved the camera and would almost pose for you when she saw you had it in your hands. Because of this we did a lot of silly things with her when the camera was out. 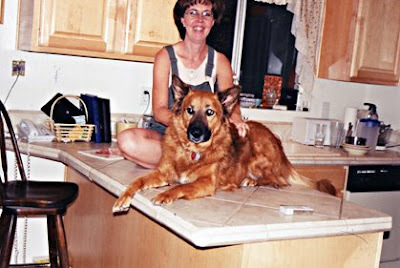 Like having her climb up on the kitchen counter!!! Don't worry, I cleaned it real good afterward. 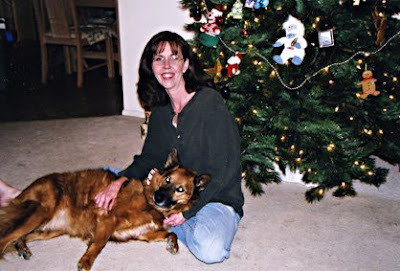 It was the Christmas tradition to get our pictures taken with our respective dogs each year after decorating the Christmas Tree. Of course we had to get the dogs all "decorated" too. Doesn't Sugar look thrilled in her Santa suit? 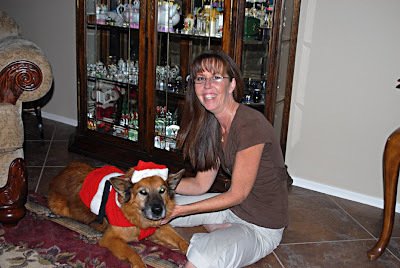 Another Christmas - but no Santa Suit, this year it was just scarves for the dogs. Just a winter day snuggling on the couch with my friend. She always had full reign of the house - including the furniture and the beds. 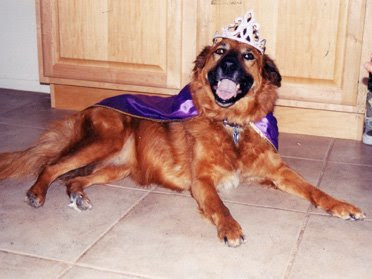 She knew she was the queen of our house, and so did everyone else! I so remember this Sunday after church. The girls and I were playing with her and dressing her up (which she always liked actually) and she just looked so natural dressed up as a queen - had to take this picture. It was perfect!!! My Sugar just loved to be outside. Sometimes in the summer when it was so hot I would have to force her to come inside the house. 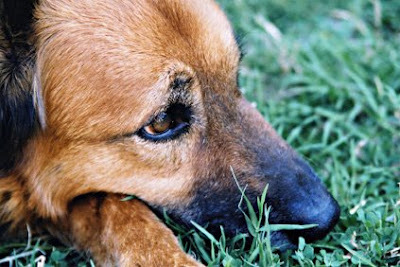 Even lately as frail and weak as she was, she loved to go outside and sun herself and I would have to force her to come in before she got dehydrated and sick from the heat. See how happy she is? I really have missed seeing this kind of joy and sparkle in her eyes the past 2 years. But I know tonight she is in heaven with all of that sparkle back in her eyes! Did I mention that Sugar climbed walls? Yep, that's right! She did this until we moved out of the old house and she was almost 14 years old! But by that time she could get up there but couldn't get down! 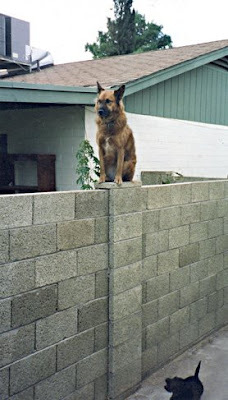 There were plenty of days that I had to try to get this dog off the fence all by myself! This picture was taken by our neighbor from his side of the fence. 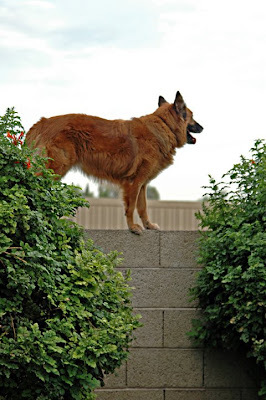 I have never had a dog that climbed fences before (but our dog Zsa Zsa does it now too - she just doesn't go over and leave the yard). Sugar has climbed walls since the 1st week we brought her home at 8 weeks old. W e tried everything to break her of it and just couldn't. Our neighbors all kinda got a kick out of it and never seemed to mind when she would pop into their yard, or through their doggy door to say hi. Here she is again in her favorite part of our old back yard - where the bench used to be. I will forever miss seeing her so proud and beautiful. But I asked God today before she closed her eyes for the last time to have my Doodle meet her at the gates and keep her company till we are all together again. 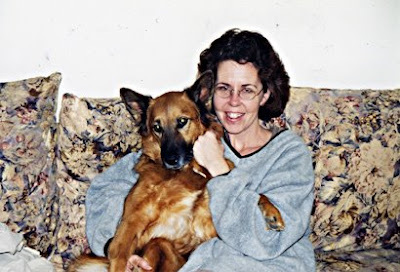 Almost 19 years ago to the day I said goodbye to my Doodle for the last time. I have given myself today to grieve and cry, tomorrow I will wake up ready to celebrate life. After all, in 2 days my dear granddaughter will be 2 years old - once again she brings me joy and takes my sadness away. Goodnight old friend - I love you so much! And goodnight to you my human friends - thank you for spending this time with Suagr and me tonight! 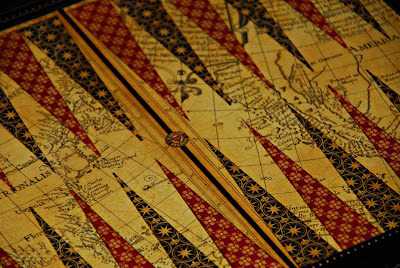 I made these two (pretty cool) backgammon boards tonight. They will be taught at The Creative Quest in October. I think they will make a pretty cool Christmas gift for someone on your list. You will get to pick which board you want to make when you sign up for the class. They are both totally different, but I really like them both! Which is your favorite? The Pink & Black was made with my 21 year old daughter in mind. Can you see the crystals down the center? This one just had to have some BLING! Click on the picture and you can see the whole board. Guess who the inspiration was for this one? Yeppers it is my beloved Graphic 45 papers on this one. This one is much more classic - almost manly if you will. I can't wait for Gary to get home this weekend. 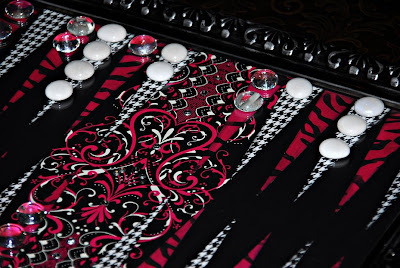 He and I love to play backgammon. We got a really nice oak board as a wedding present. Twenty-five years later we are still playing on that same board. I think it is time for a change! My Monkey is turning two in a couple of weeks!!! I can hardly believe it! This of course means it's time for me to start creating! 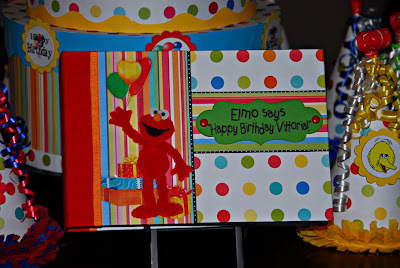 (Surprise surprise) She is having an Elmo/Sesame Street party this year. So here is what I came up with. 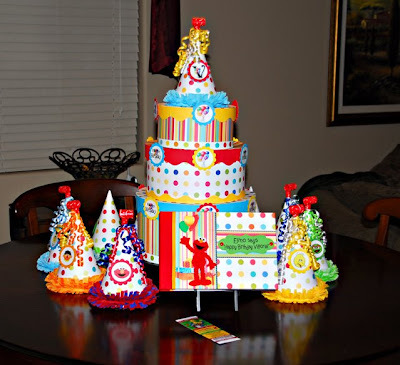 . .
A 3-tiered birthday Cake made from paper mache hat boxes. I did not add the Sesame Street stuff to this so that she could use it for each birthday. It will all stack inside it's self so it will be easy to store. Next are the Centerpieces. Bryanna bought table cloths in all the characters colors (10 round tables) so there will be a character hat on each table. We rented the Clubhouse at our pool for her party. Lots of guests and scorching hot days means you need to be inside or by the pool. This gives us the best of both worlds! Last but not least is the Book. This will be out at the party as a guest book for people to sign (on the "Count your guests" page only) after the party I will fill it up with photos from the party for my Bryanna. All of this white and primary colors was a challenge for this "dark, inky & vintage" girl! If you want to see the insides of the book and close-ups of the cake & hats just click on the 1st photo. So Now I am done with the brights - it's time to get busy in my color scheme. The Next two days I will be busy cutting paper and making kits for some upcoming classes. What are your big plans for this week????? Whatever it is I hope you find a way to stay cool! I hope you all have a great day and enjoy some time with your family at a BBQ or at the fireworks. Be safe and have fun! Hey Friends - just catching up with everyone quickly here. Life is great I am keeping so busy with my Monkey and the family. I have also been busy online planning Lizzy's 21st birthday trip to Las Vegas. It is tradition that I take the girls to Las Vegas on their 21st birthdays. This December is Lizzy's turn. When I am not with my family or online making reservations, I am locked away in my studio creating. Below you can see some of what I have been creating. This is the latest book. . .
Of course it is made with ALL G-45 papers (you know I love them). 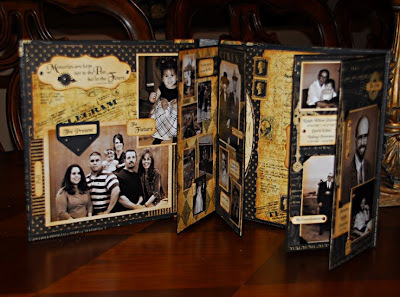 Lots of flips, folds and pull outs in this handmade book. It includes Genealogical fan charts as well as photos of my family, starting with my grandaughter and going back to my Great-grandparents. There are 2 sections to the book. The right side is "My Past" it is divided up by my Mom's side of the family on one side and my Dad's on the other. Inside the front cover (left side) is my "present & future". Be watching the calendar at The Creative Quest for the date of this class. You can click on the photo here to see the rest of the book. 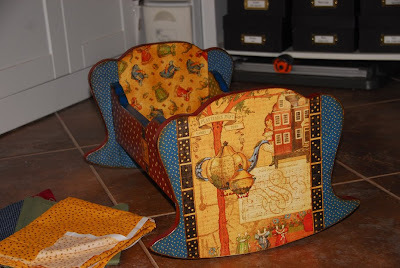 This is the "before" photo of the cradle I told you I was working on for Monkey. This is the "after" picture. I still don't have the bedding made, but the fabrics are all purchased. You can se them in the bottom left of the photo here. Lastly I had to share this picture of Monkey from yesterday. She kept telling me she did NOT want to take a nap. She was happy and playing well so I let her be the judge of how tired she was. She had been playing on "Kong" the monkey, laughing and talking to her "meow meow" (toy lion) and all of a sudden it was just quiet. I looked up from what I was doing and she was sound asleep on Kong! 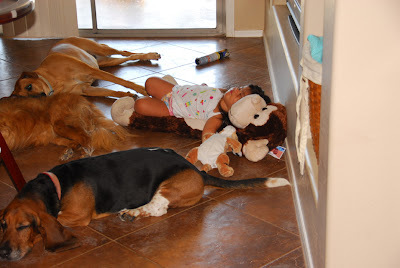 When I came back with my camera the dogs had all circled around her as if to protect her. She slept there for about 45 min. I have NEVER seen this child just fall asleep right where she's at. She must have been really tired!!! Speaking of tired - that's what I am now - talk to you all soon. Have a fun and safe holiday weekend!!! !